This Trendsetting Tuesday is about a new website that has recently launched and is open for business! Shop Love D Shoes is a women’s shoe store located all over Southern California and has now joined the world wide web. Love D Shoes was established in 1992 and currently has 14 store locations. Specializing in women’s footwear, this store is where I grab some of my favorite shoes of the season. With reasonable prices and great promotions such as 30% off or buy 1 get 1 50% off, there’s no way I won’t take a peek inside the store. What’s great is that now they are available online to show me what they have in stores. While the site is fairly new and still being worked on, I already have a couple that I love! To make things even better they are having a New Year’s promotion! For a limited time you can get free shipping AND 30% off your entire purchase when you use promo code “NewYear30“! So let’s take a look at my top shoes! The first is Bamboo- Sharpay-05 in black. Currently I’m obsessed with booties and these are the perfect ones to complete any outfit. With gold buckles and 3 inches of chunky heel it’s my fav. What if you could splurge on everything you wanted and feel no regrets? We know there’s more to life than material possessions and believe me we all aren’t movie stars with a wad load of cash. But if you do happen to stumble across a certain something that you can’t stop thinking about, there are always alternatives. Let’s look at your options! 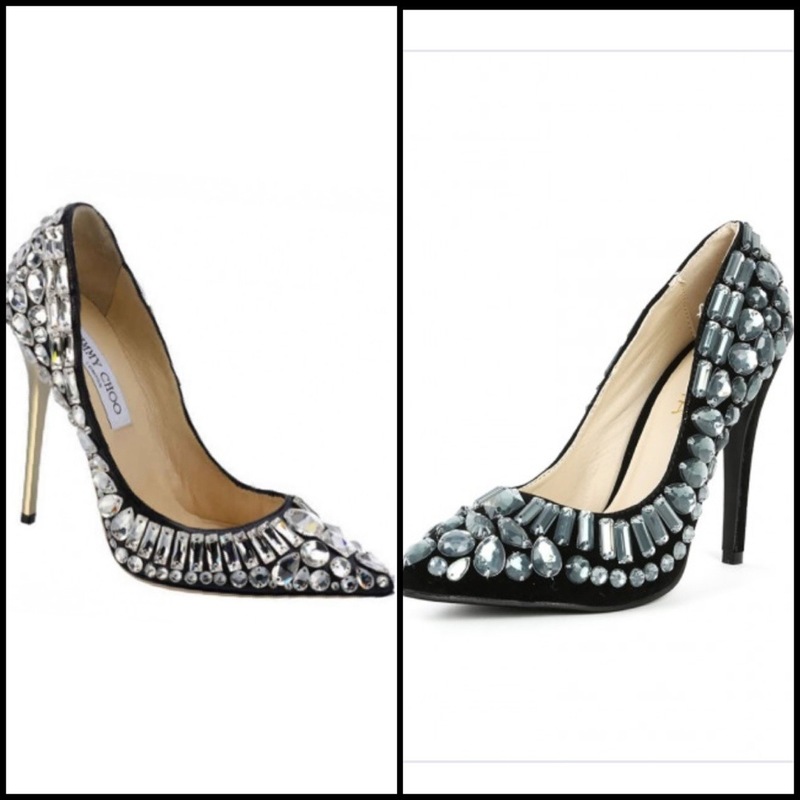 Jimmy Choo came out with an exceptionally glamorous Tia heel, bedazzled and bejeweled, this heel is on point! Black, pointed toe and a gold heel this would be a must-have but with a selling price of over $4,000, we need to reevaluate our wants. That’s when I stumbled across the site Make Me Chic and found the Liliana Rubik-3 (featured on the right) for a whopping $49. While it might not be your dream Jimmy Choo shoe, it’s better than nothing and still quite cute and affordable to splurge on for any upcoming festive event. We’re not made of money but if this Steal shoe from MakeMeChic.com has you falling in love like it has me, you can find it HERE. Have any Splurge vs. Steal ideas? Comment below! Remember to grab more style ideas from my Trendsetting Tuesday posts. For this week’s Trendsetting Tuesday I bring you single sole shoes. This latest craze in the shoe world is taking a step down from the platform, chunky heel we’re all so used to and going for a much simpler look. Sophisticated yet casual at the same time, dress these shoes up with a LBD for a night out on the town or some boyfriend jeans, tee and leather jacket for a brunch ready, shopping afternoon. Every brand has it’s own version ranging from $20-$2,000+, these heels are versatile and easily accessible. Sure it takes some getting used to with little to no support or cushion. I guess we’re just so accustomed to having a pretty thick platform to make our foot’s life a lot easier. Little by little take in this new trend with caution. As for me, I’ve already fallen in love with the style and can’t wait to put my new wine colored heels to use.